After the difficult kayaking through Medway, the open expanse of Populatic Pond was a welcome relief. It gave us the opportunity to drift lazily in the breeze and fill our bellies with snacks. The downstream exit from the pond was just a few hundred yards along the North coast. The Charles River then winds wide through a marsh, actually an extension of the pond itself. The river languishes peacefully with just a gentle current to urge us downstream. Then there is a sharp turn as we passed under the Myrtle Street bridge. 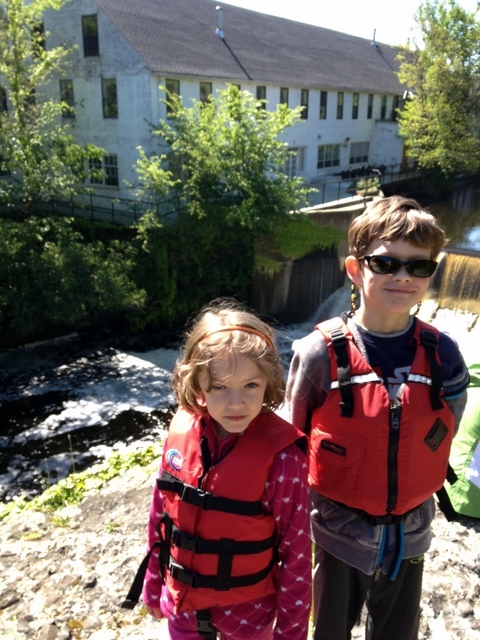 In our high water, there was a set of rapids ahead, giving us a fun, quick ride downstream. But towards a treacherous island in the center over the river. A few quick strokes pushed us around the obstacle. There was a temporary slack as we passed under the power lines, then another big push as the river squeezed through the abandoned railroad abutments of the Medway Branch Railroad bridge. We hit calm water for a bit more, then we saw an old house straight ahead on the left bank of the river, as the river takes a sharp turn right. Around the bend is the Pleasant Street bridge. And a nasty set of rapids. 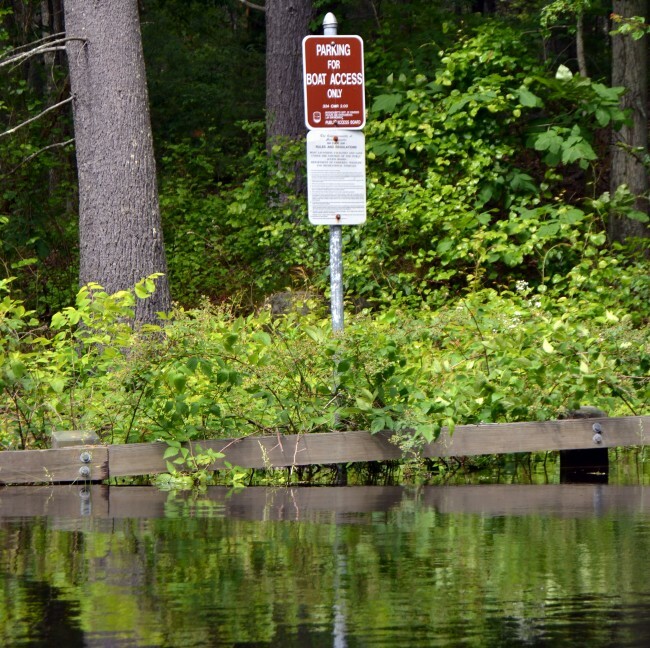 According to Ron McAdow’s guide to The Charles River, it’s best to stay on the left during high water. At medium water, the right side is better. And in low water you may need to portage over the obstacles. Since we had high water, we went left. First we hit an off camber drop that spun us right, I dug in hard to turn us straight downstream and to skitter through the bumps and troughs of water. But I missed one near the end and we high-centered on top of a rock with the river rushing past us. Fortunately, it only took me a hop up and down out of my seat to catch some water under the boat to free us. We quickly reached the Route 115 bridge, then the riverbanks became wild once again. At least relatively wild. The right bank is plastered with warnings that it is used as shooting reserve and not to trespass. The left bank is largely undeveloped and eventually yields to the Cedariver, a Trustees of the Reservation property. You end up with about 1.5 miles of calm, scenic river to paddle. The last obstacle is the Forest Road bridge. The bridge sits low over the river. We were riding high water and there was only about a foot and a half of clearance. We were not sure if the bow of the kayak would fit under. Even if it did, we were even less sure that the two of us and the kayak would fit. There was only one way to find out. It was snug. 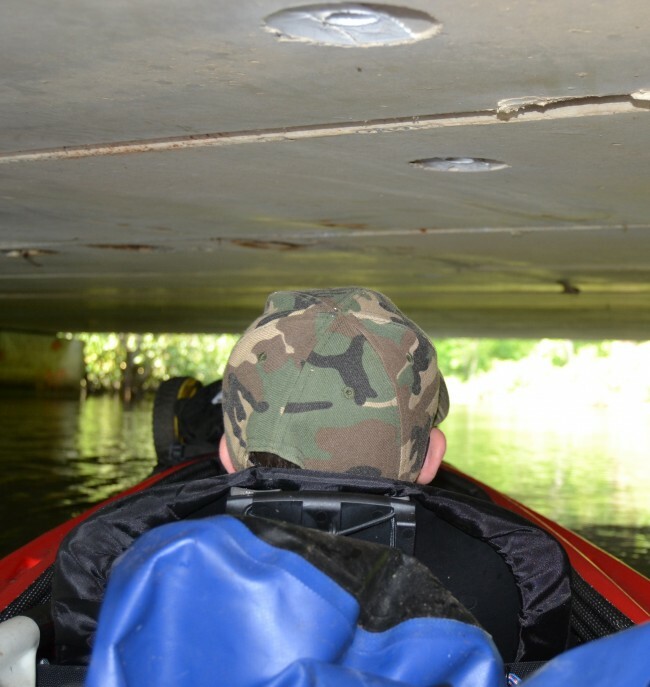 We didn’t have room to paddle, but we could reach up and push ourselves using the underside of the bridge. Just past the bridge is a small parking lot that is often under water. The water level had dropped about foot since we were here last weekend paddling through Area F, but the lot was still deep under water. We knew this would be a difficult stretch of the Charles River. The Medway section of Charles River has two man-made dams: the West Medway dam and the Sanford Mill dam. And we were far enough upstream that we could encounter other obstacles in the thinner water. It turns out there were lots of obstacles. The first obstacle was getting onto the river. 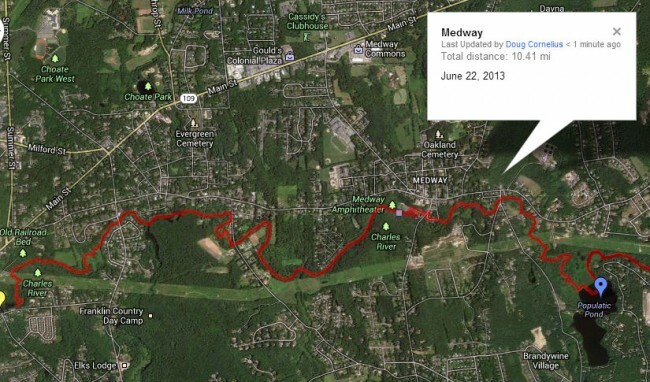 We wanted to put in just downstream from the Caryville Dam in Bellingham by the Medway border. After the dam, the river rushes under Pearl Street and into the bowels of an abandoned factory. It’s not clear what the river encounters in that dark tunnel under the factory. Even if you want to find out, you can’t get close. The factory is surrounded by a chainlink fence blocking all access to the river. It looks like there are some good spots to put in at the rear of the building, but the fencing blocks access. Around the corner on Plain Street, there is an empty lot owned by the town. But there is no path down to the river. You have to hack through trees and undergrowth down a steep embankment. It’s covered in poison ivy. Under the poison ivy is a deep coating of debris, broken glass, and trash. It’s a nasty place to start a kayak trip. After finally getting in the river, we immediately hit obstacles on the river. There were dozens of trees down in the river. Some we could limbo under. Some we could squeeze around. Then we encountered big trees completely blocking the river. The first one was so big we got out onto the mostly submerged tree trunk and hauled the kayak over the obstacle. The next big one was three trunks in a row. The Boy hopped out on the first trunk, made his way to the riverbank, walked downstream and walked out onto the third log while I wrestled the kayak over the obstacles. At the next fallen tree we finally realized something else was at work. There was a long line of logs and smaller branches forming a dam across the river. Off to the side I saw a mound of smaller branches. Beavers! The riverbanks were very swampy in this area so there was no easy way around. The drop over the dam looked to be no more than two feet, so we decided to go over. We buckled down the dry bags and flew over the drop. Now we knew what to look for. 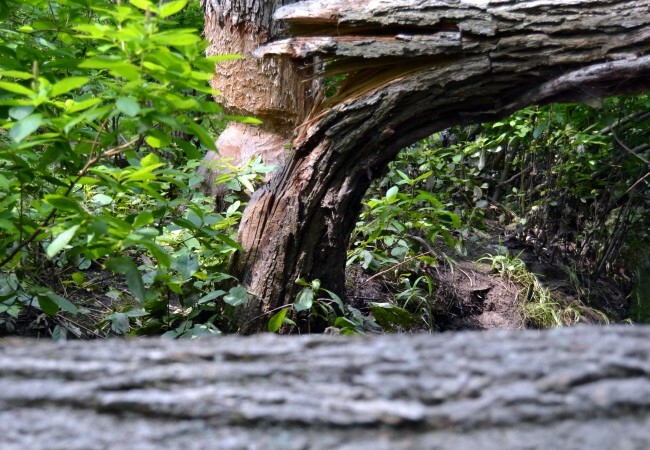 As we encountered more fallen trees we could spot the telltale gnaw marks of beavers hard at work. From the look of things there will be several more trees falling in the river soon. Eventually, the river widened and slacked. This was a sure sign that there was big dam ahead and more likely man-made instead of beaver-made. The river forked. I had to check the map for directions in the slack water. Mine Brook entered from the right. We quickly came upon the West Medway dam. You can see large stone blocks on the left bank, the site of the old mill. 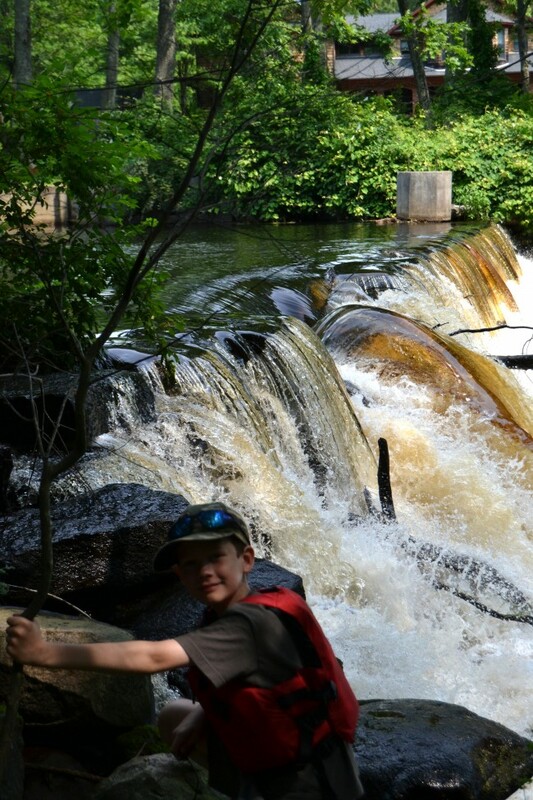 It’s a short portage on the right side of the dam, with a short stretch through the fast water tumbling over the dam. A dam was first built on this site in 1812. It mostly powered paper mills. Then it was back to more beaver dams. Or maybe they were just fallen trees. Regardless, we started blaming all of the obstacles on beavers. Soon we encountered the big rock, a large white rock in the middle of the river. The river widened and slowed. The Sanford Mill dam was just ahead. Built on the site of the White Mill which burned in 1881, the Sanford Mill was built through the finances and efforts of Milton H. Sanford. Mr. Sanford would become one of the Medway’s greatest benefactors. Sanford owned wool and cotton mills which manufactured blankets for the Union Army during the American Civil War. The mill was later owned by the Fabyan family of New York, and became known as the Fabyan Mill. John Reardon of Medway and later the Reardon family operated it as a textile mill for many years, and around 1990, the building was converted to condominiums. Before it closed, it was one of only a few textile mills still operating in New England. It is a long portage around the dam. Long enough that my Paddle Boy wheels fell apart. That was disappointing result after only having the Paddle Boy for two weeks. Downstream is long stretch of rapids. It’s a fun stretch of river. Of course, after the river left the rapids we encountered more fallen trees. Eventually, we saw a large treeless expanse ahead. We were closing in on Populatic Pond. After a few twists and turns we splashed into that wide open expanse of water. 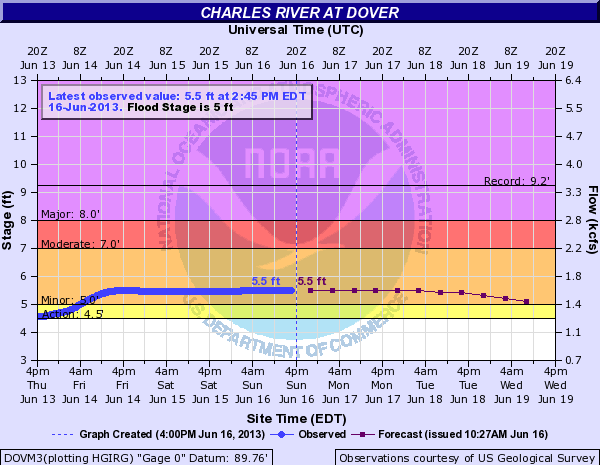 June has been a very wet month and the rain of a few days ago has pushed the Charles River into flood stage. I thought it would be a good day to see how the river looks in flood stage. This section of the river also is part of the flood control measures for the river. We put in at Forest Road in Millis. Literally at Forest Road. The parking lot and launch area was underwater and we launched the big red kayak from the side of Forest Road. 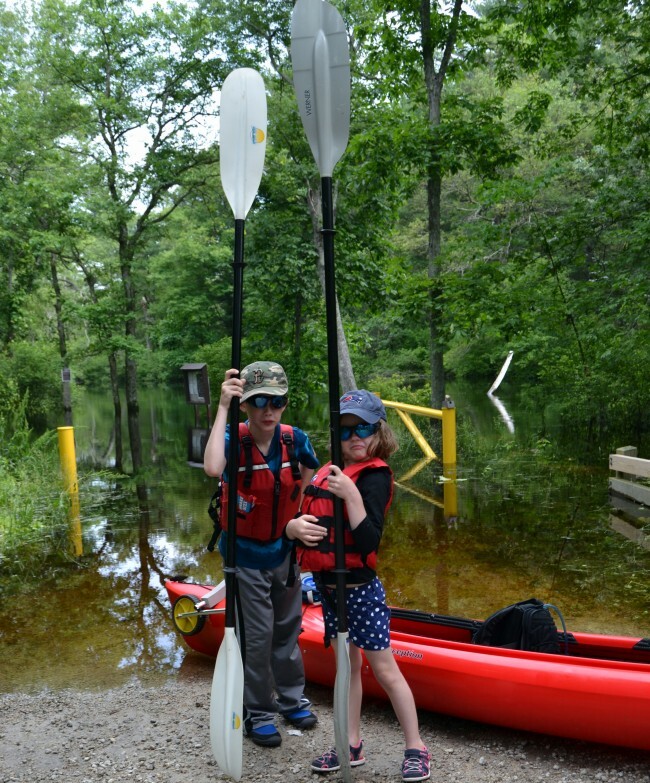 We already had our first taste of the floodwaters and had not even started paddling. For those of you who are only familiar with the Charles River Basin between Cambridge and Boston, this upper stretch of the Charles River is nothing like the Basin. 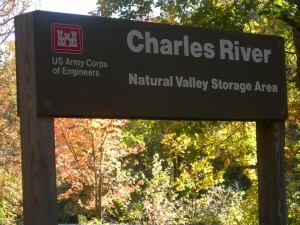 This section of the Charles is part of the Natural Valley Storage Project. 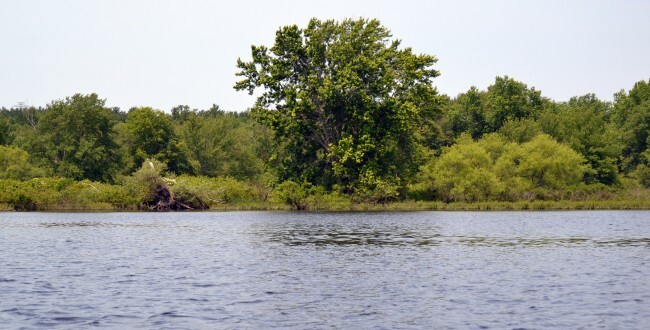 In 1974 Congress authorized the “Charles River Natural Valley Storage Area,” allowing for the acquisition and permanent protection of 17 scattered wetlands in the middle and upper watershed. The final acquisition totaled 8,103 acres, with 3,221 acres of land acquired in fee and 4,882 acres in flood easement. These wetlands form a natural reservoir. They soak up the floodwaters and allow the water level to spread over a wide area. Otherwise the heavy flow of water would rush downstream and flood the developed areas along the river, including Boston itself. Area F is the largest area of the Natural Valley Storage Area and lies in Millis, Medfield, Norfolk and Sherborn. With all of the rain, Area F would be put to it’s test of holding flood waters. Only boats would be parking here today. The Charles River meanders quite a bit in this section, swishing back and forth through the marshy wetlands. With the high water, we were able to cut across some of the meanderings as the water flowed right over some of the marsh. On one bank was Millis, on the other Medfield. This area attracted the first settlers of Medfield. The natural hay from these meadows along the river was valuable fodder for their livestock. At one stretch, the left-hand bank in Millis is owned by a hunting club. We could hear some shotgun blasts echoing across the valley. I had a bit of concern about our ability to fit under the Route 109 bridge. It’s smallish opening helps hold back some of the water in Area F, pushing it out into the meadows. But we were able to make it under with reasonable clearance. The next obstacle was the railroad bridge just downstream of the West Street Bridge between Medfield and Millis. Originally, this section of Millis was part of Medfield. Since the town’s Puritans lived on both sides of the river, they needed a bridge to get back and forth to the weekly meeting. The original bridge was constructed in 1653. 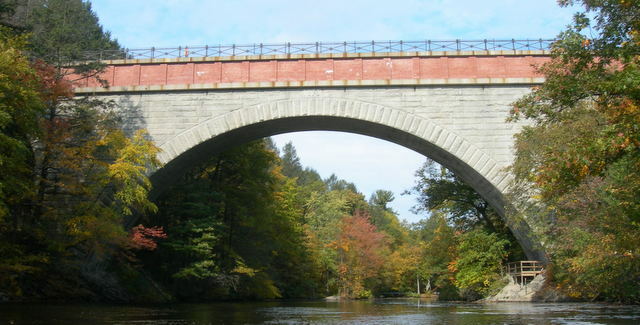 During King Philip’s War, the Native Americans burned the original bridge in 1676. The trestle offered narrow openings and the bloated river was flowing quickly through. A few quick, sharp strokes got the kayak in position, through, and out the other side. As we paddled further downstream, the floodwaters spread far across the marshy valley. I was hoping to be able to paddle up Bogastow Brook. This is the largest tributary of the Charles River. With the wide expanse of the floodwaters it was often hard to find the path of the river as it flowed over marshes, bushes and trees that normally cut a path for the flow. This is Area G of the Natural Valley Storage Area. I thought I might not be able to find the brook. Eventually I saw a bigger opening and an obvious flow of additional water. It was a short, twisted path upstream to South End Pond. I assume this stretch is normally a bit scratchy, but the floodwaters made it easy to get upstream. After making it to the pond, we headed back to the Charles, downstream to the Route 27 bridge and the takeout. Striking a pose at the put in. The section of the Charles River running through Rocky Narrows and past the Broadmoor Sanctuary promised to be idyllic. This stretch of the river is mostly bordered by protected land. Route 27 provides a small parking area for a half dozen cars and a pebbled path down to the river next to the bridge. Rain came down heavily in the previous 48 hours so there was some obvious flow to the river. The Route 27 bridge is a standard steel and concrete bridge, leaving a rather ugly overhead to start the trip. Just downstream is a railroad bridge. Although it looks abandoned, Conrail uses it occasionally. I have been surprised by a locomotive on the tracks while mountain biking in the area. We had the treat of watching a model airplane fly overhead. The kids were fascinated by the replica and had no concept of the plane’s size. It could have been 6 inches or 6 feet. There is a popular landing strip next Rocky Narrows. I usually see a great replica or stunt model on a nice weekend day. Towering up to the left is King Philip’s Lookout in Sherborn Town Forest. This is a 100 feet of bedrock that pushes the river to the right into a marsh. A bit further downstream, the river passes though the twin towers of Rocky Narrows. The granite on the left and right squeezes the river together and adds a quickening, although still gentle, pace to the downstream flow. Off to the right we saw construction fencing that cut off the backside of Medfield State Hospital from the river. I know there is a great bike trail over there. I’ll have to go back and see what construction is happening over there. Off to the left is the Rocky Narrows Reservation owned by the Trustees of the Reservation. It’s 227 acres bracket the Sherborn Town Forest resulting in almost 400 acres of protected land on the riverfront. There is a good landing spot marked with a Rocky Narrows sign. It’s a great place to pull out for a picnic and go for a hike. Since we had just started the day, we kept paddling. The right bank of the river in Dover has a few houses but they are well set back from the river. 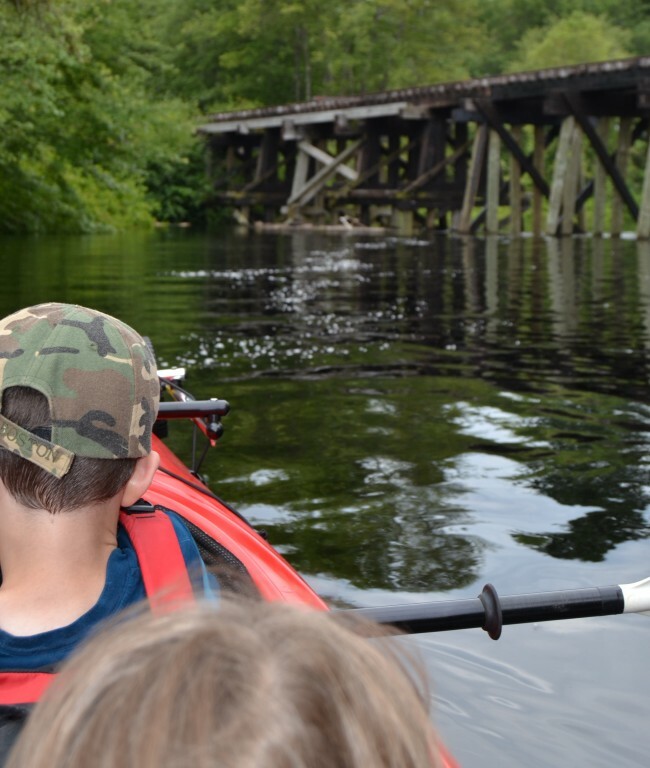 The Farm Road bridge is another great landing spot, but we keep paddling. Peters Reservation is on the right bank of the river. Peters Reservation is named for the family who originally purchased the property as a family retreat. The trails and understory plantings were laid out by the landscape architect Fletcher Steele. The property is currently owned by The Trustees of Reservations. The reservation is located across Farm Street from the Chase Woodlands, another Trustees managed property. 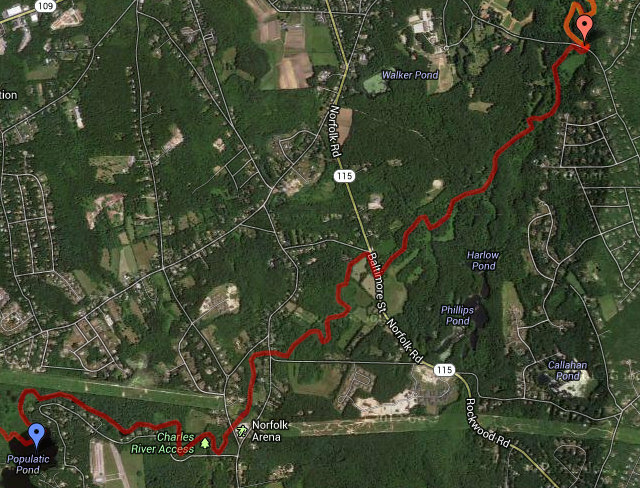 After a few more turns, the river leaves Dover and Sherborn and enters Natick. The Broadmoor Wildlife Sanctuary owns the left bank and a large stretch of the right bank. Indian Brook flows through the sanctuary, floods into a marsh, and eventually leaks into the Charles River. Unlike the Trustees’s properties upstream, Broadmoor has no landing spots. The river takes a sharp left hand turn after passing the Sanctuary. This stretch is rocky and there are a few outcroppings to avoid. For us, the water level was still high from the recent rain so we floated over most of the obstacles. Then houses appear on the left bank of the river, with noisy Route 16 behind them. The idyllic section of the river has ended and suburbia has sprung up. 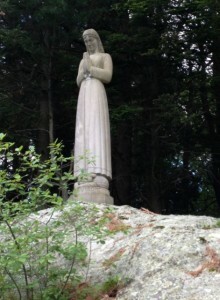 On a rocky outcropping on the right hand bank appears a statute of the Virgin Mary. It was placed there by Daniel Sargent who purchased both sides of the river in this spot in 1921. The words at her feet state: “Apparverunt in terra nostra flores”. The flowers shall appear on our earth. Sargent also built the delightful footbridge just downstream from the statute. From there it is a short distance to the South Natick Dam. There is parkland on both sides of the dam. However, the left hand side is steep and walled. The right side offers a few spots to softly land and exit the river. 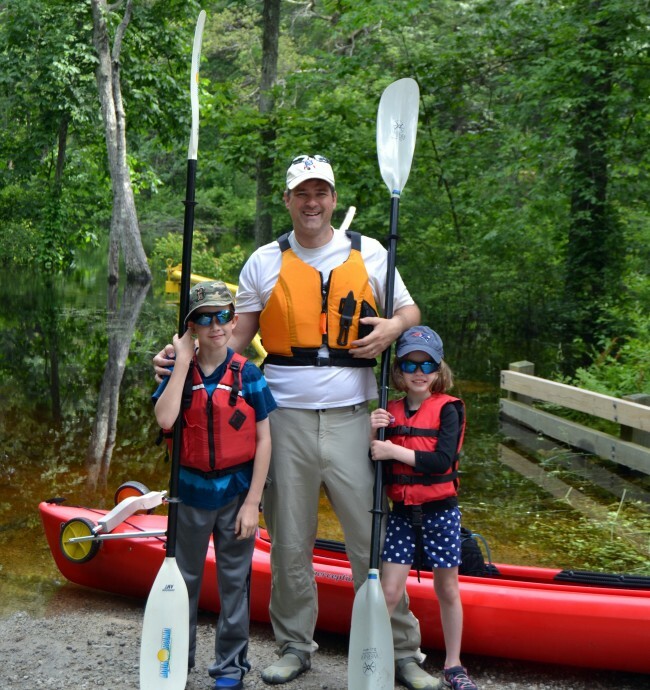 I launched the new red double kayak from Nahanton Park in Newton. The Boy was in the front seat and The Girl was in a jump seat plopped between my feet. 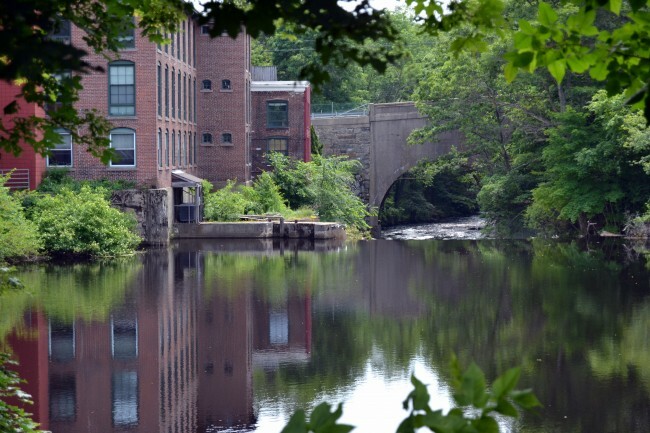 The Hemlock Gorge section of the Charles River is the beginning of the more urban section of Charles River, passing houses, factories and highways, than the upper stretches of the river. 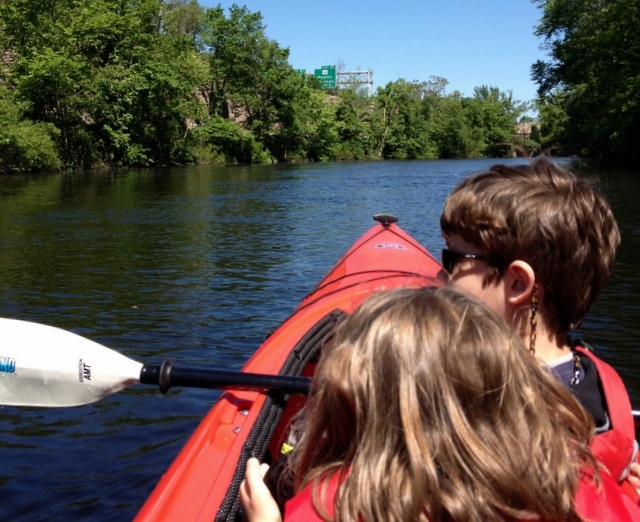 Nahanton Park is one of the newer locations of Charles River Canoe and Kayak. It is a less visible location than it’s main location next to the Marriott, but it’s a much nicer stretch of the river. There is plenty of parking and a dock at the park which makes the launch very easy. 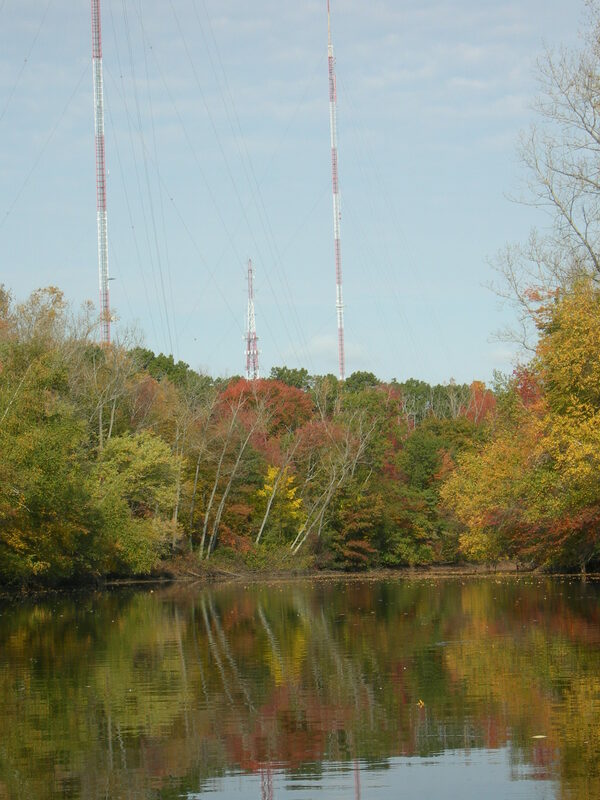 The Needham radio and television towers are visible in the distance once you enter this section of the river. There are significant industrial buildings along the river. If you remember your history of the industrial revolution in the northeast, this means there are dams along the river. There are three portages ahead, sure to be a challenge in the big new kayak. 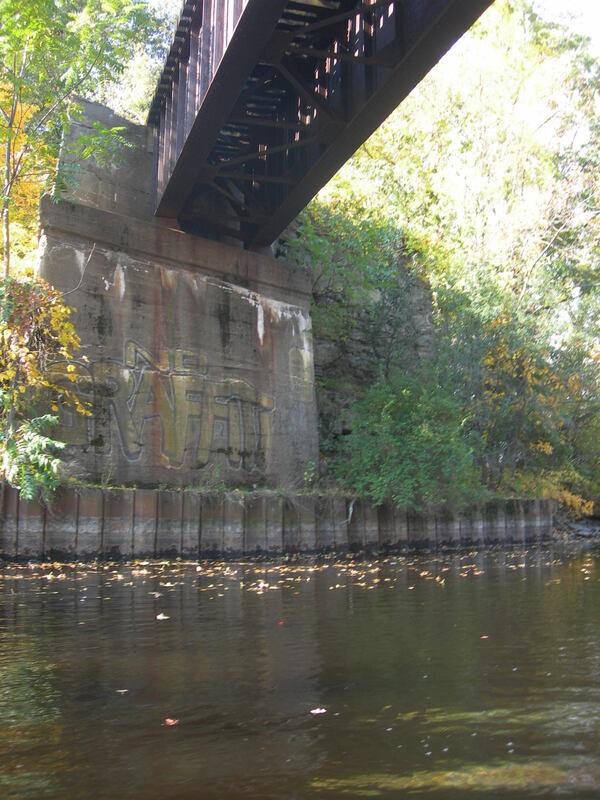 There is a modern railroad bridge abutting older stone abutments which mark the location of an older bridge. This bridge was for the Charles River branch of the Boston and Worcester Railroad. Built in 1850, this rail line was built to bring stone and gravel from Needham to fill Boston’s Back Bay. During its peak, forty car trains of fill ran every 45 minutes. The Elliot Street Bridge is made of three stone arches and appears just before the Silk Mill Dam. There are new signs warning of the approaching dam. You can see the river disappear and hear an increasing roar as you pass under the bridge. There is a good spot to take the kayak out of the river and start the portage. It was fairly long walk of about 300 yards through Hemlock Gorge Reservation, leading down into Hemlock Gorge between Newton’s Upper Falls and the Echo Bridge. With the weight of the new kayak on my back, I realized I needed to get some wheels for the portages. Halfway down the portage, there is a great spot atop the rock of the gorge. The old mill building is across the river and you can feel the force of the water poring over the dam. The fall of water at Hemlock Gorge was an attractive power supply for industry. In 1688 John Clark built a sawmill. His sons expanded by adding a fulling mill and a grist mill. In 1788 Simon Elliot bought part of the site and put in a snuff mill. In 1824 a cotton mill was added, which was later converted to a silk mill. The dam is often called the Silk Mill Dam because of this long running use of the dam. Just downstream of the Silk Mill Dam is Echo Bridge. It is famous for the wonderful echoes that can resonate back and forth between the arches. Yes, we all hollered out as we went under. The echo was very impressive. Echo Bridge carries the Sudbury Aqueduct. 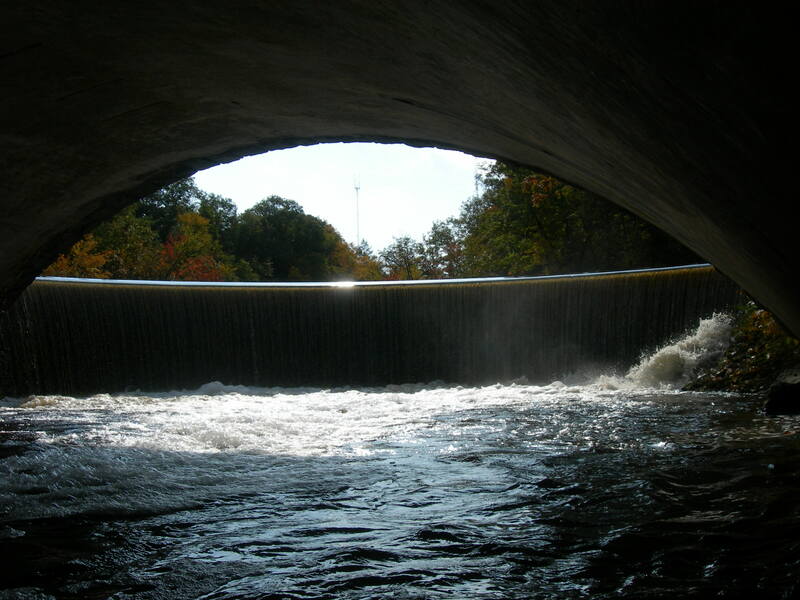 In 1878, the mainstream of the Sudbury River was diverted via the Sudbury Aqueduct to the Chestnut Hill Reservoir to supply water for the City of Boston. The bridge was built in 1876, spanning 130 feet across the Charles River. Next on the river was the Circular Dam or Horseshoe Dam. The dam was not marked and it was harder to hear because it was right next to the overpass for Route 9. This is also the site of a portage under Route 9 on the Ellis Street underpass, down to Turtle Island. A millrace was put in place here in 1782 for a sawmill. In 1792 Newton Iron Works took over and rolled iron bars for 50 years. 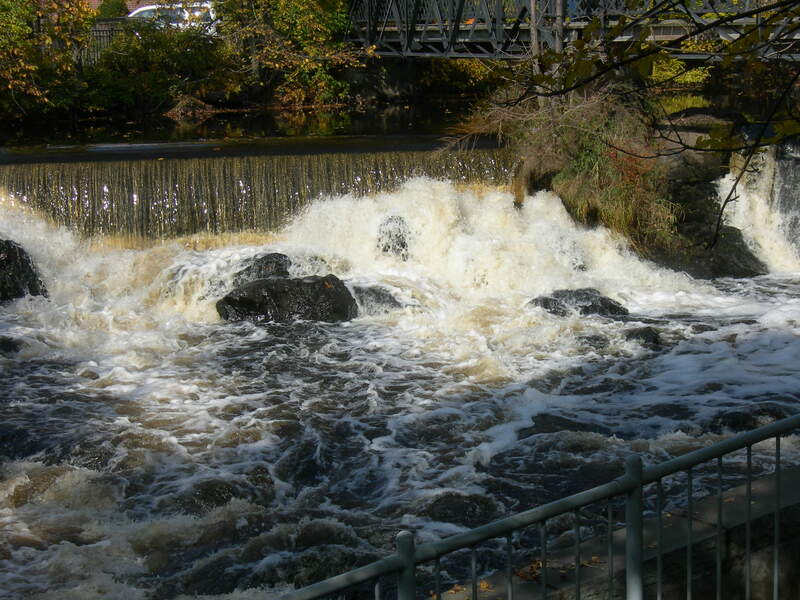 The millrace is to the right of the dam and is the landing spot for the portage. There is a new spillway put in place that makes the bank a bit more steep and the exit a bit harder. The Charles then follows Route 128/ Interstate 95 for a few miles. The road signs on Route 128 are visible from the river. The right bank of the river in this section follows Quinobequin Road in Newton. The left bank has relatively new sound barriers along 128 that greatly reduce the traffic noise. Vegetation has grown along the walls, but they still look massive and tower above the river. After passing under Route 128, we passed under the Cochituate Aqueduct crossing the river and under 128 on a three-arched bridge. The Cochituate Aqueduct was built in 1848 to carry water from Lake Cochituate in Framingham to the Chestnut Hill Reservoir. It serves a similar purpose to the Sudbury Aqueduct that runs through Echo Bridge. Just below Water Street in Wellesley is the Cordingly Dam. The last time I was here I entered the river to early and floated through the rapids unsuccessfully, leaving me flapping in the river like one of the herring in the dam’s fish ladder. Since I had the kids I was not going to risk tipping the kayak, so we took a much longer portage downstream. We ended this stretch of the river at Washington Street / Route 16 in Wellesley at the top of Newton Lower Falls. You can the rest of my paddling trips laid out on a map: Paddling Trips. The Boston Public Library has posted a collection of Newton post cards using Flickr. 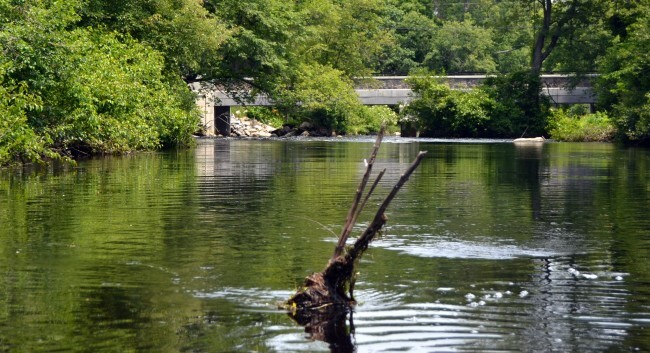 Several of the pictures show how the Charles River used to look in its run through Newton. 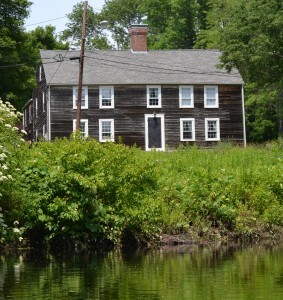 The Boston Globe West has a story from the Newton History Museum at The Jackson Homestead focusing on the impact of the Charles River on Newton: Pages From Newton’s History. The City of Newton is defined by the Charles. It has the river on its borders in the south, west, and north, and it was on the river’s banks that the city got its start — not as one unified town, but at first as a string of villages that grew up along the watercourse that provided abundant power for mills and manufacturing effots. Improved transportation — first roads, then rail — gave those factories better access to markets. It also tied together the villages of Newton and brought the 18 square miles of farms and woods bounded by the Charles into a closer relationship with the metropolis at its doorstep, Boston. The Charles today is slow and civilized, tamed by dams that have turned it into a series of elongated, picturesque lakes that make the river a marvelous resource for recreation and natural beauty. The original purpose of those dams was almost the opposite. They made the Charles a very hard-working river.